Gap Year Programmes - overseas travel and volunteering rolled into one! The last twenty years have seen a huge explosion in the number of school and college leavers taking gap year programmes before joining university. The incorporation of some formal period of volunteering into these gap years is becoming an expectation, not just of the students themselves, but of university admission departments and employers alike. 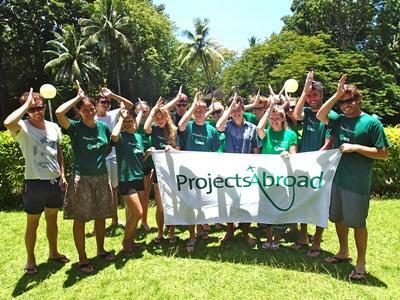 This phenomenon has completely changed the face of overseas volunteering as far as Projects Abroad is concerned. As the world’s leading international volunteering organisation, we feel we are well placed to ensure that the “gap year” has a positive and long-lasting effect on the developing world. Long may it continue! Since 1992 we have witnessed the incredible impact that volunteers on gap year programmes have had on our various placements around the world; whether that be as part of a Teaching project in Ghana, a Care project in Nepal, a Conservation project in Peru, or one of our many other projects around the world. Students may not be considered old or experienced enough to be given much responsibility in working environments here in the UK, but we consider them to have the right mixture of energy, enthusiasm and empathy needed to volunteer. This is why we continue to put our faith in students on gap year programmes - by offering them a range of placements that you simply won’t find with any other volunteering organisation. If you are a student looking to volunteer abroad, then you can choose from a huge range of projects in 30 destinations around the globe. You can volunteer on our projects for as little as two weeks and choose your own start dates - perfect for fitting into a busy gap year! If you are currently in college or school, considering taking a gap year, but not yet sure whether it is the right thing for you, then you may be interested in our High School Special projects. These are effectively “tasters”; you get to spend two weeks with a group of other volunteers aged 15-18, finding out exactly what volunteering is all about. These trips are fully supervised and our local staff will even take you out on evening and weekend excursions. To get started, take a look a look at the volunteer projects that we offer and the volunteer destinations in which we operate.